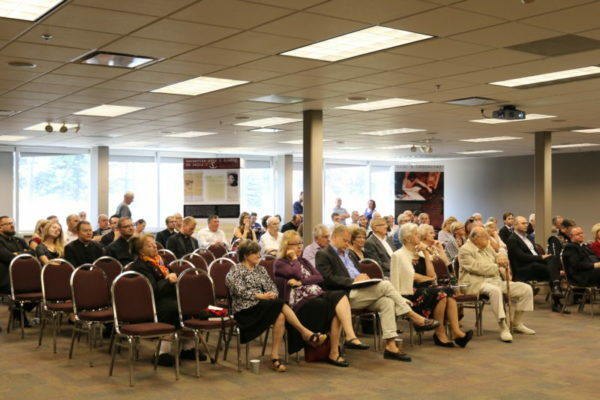 The second meeting of Polonia took place on September 15th in one of the halls of Adam Maida library in Orchard Lake. An organizer of the event was the Polish Mission. During the first summit of Polonia in October 2017 father M. Król emphasized a meaning of a constant cooperation with Polish centers in USA. At that time the meeting was joined by representatives of many Polish organizations, more than 140 people from different states: Michigan, Illinois, Ohio, Washington DC, New Jersey as well as from Canada. –	How can Orchard Lake serve Polonia, Poland and Poles better? –	In what way can Orchard Lake contribute to strengthening American Polonia and our Catholic values? In this year’s meeting took part 25 participants from Detroit metropolis, including a president of KPA in Michigan Anna Bańkowska, as well as chairmen of the management boards of the Polish Mission. The event was also attended by: The General Consul of the Republic of Poland in Chicago Piotr Janicki, the honorary consul in Detroit Ryszard Walawender, a representative of Polonika institute Dr. Karol Guttmejer, priests from a Cracow seminary, members of a “Śpiewajmy Panu” choir at a Holy Trinity parish in Chicago, of which conductor is Dr. Górecki and representatives of the Society of Katyn Rally Memory (Stowarzyszenie Rajd Katyński Pamięć i Tożsamość) from Chicago. In Polonia’s forum took part around 80 people. After the welcoming remarks made by a father chancellor Mirosław Król and a director of the Polish Mission Dr. Górecki, who presented his actions carried out to promote Orchard Lake, took place a presentation of a movie about the Seminary and a work by father chancellor Mirosław Król. About an essence and a key role of the Archives talked father Stanisław Flis: A nation, that does not respect its past, does not deserve to be respected by a present and has no right to a future. Now the exhibits are located in around 4 thousand archival boxes garnered in 8 rooms. Father Flis informed also about what the further process of providing the archival materials would be like. For 8 years it has been helped by The Head Office of the State Archives in Poland which delegates professional archivists to help put in order the collections. The archives of Orchard Lake also cooperate with the National Digital Archives. I cannot wait for the central Polonia’s archives to enter the age of a digitalization and for all the information to be accessible in one place due to an application called Integrated System of Archival Information – ZoSIA. ome projects promoting Polish language. About Seal of Biliteracy and standards undertaken by Mrs. Owiński we were informing on-line in “Polish Weekly”. Seal of Biliteracy is a commendation in a form of the stamp on a final certificate conferred for a fluent knowledge of at least one foreign language, in our case Polish. The results of the taken actions are visible, the Polish language tests are already wrought and since 2th April 2018 widely available. Mrs. Owiński informed that by the end of May the tests had been taken on by over 350 people. For the second time in Michigan we will be celebrating the Bilingualism Day. The event will take place in a Cultural Center in Troy on Sunday 28th October. It must be stressed that the Polish Mission in Orchard Lake in recent years has consequently realized the projects promoting learning Polish Language. About museums, their specificity and function talked a conservator of Museum JJ Przewozniak. The director of the Polish Mission Dr. Górecki informed the attendees about the newest “discoveries” made with a help of workers of the university in Toruń. Their visit in Orchard Lake was financed by Ministry of Culture and National Heritage. Only one of the tidied museum room was enough to discern lots of precious exhibits, some of them one could watch on slides: striped clothing, a protestant Bible from 16th century or satirical pictures by Stanisław Teogel from the “Hitleriadamacabra “series. Director Górecki is faced with a huge challenge to tidy up and index the museum’s objects. He also, according to his reassurance, applied to Polish government for a help and has it promised. I remember the beginnings of the Polish Mission as a separate organizational entity in a structure of Orchard Lake Schools. After a period of numerous meetings, plans, discussions, analyzes, came to an existence a non-profit organization called the Polish Mission, to which concur: The Central Archives of American Polonia; museum’s collections dedicated to the Home Army, II Corps, Polish pilots, Holocaust prisoners, 1st Armoured Division commanded by General Maczek, Polish Falconry from Detroit, Polish veterans of the first and second world war; Polish Art Gallery; the Historical Panorama; the Library of Rare Books. Thanks to the efforts of a past chancellor father Stanisław Milewski – Dr. Edward Wikiera and his wife Josephina established in their testament a foundation which aims to provide wherewithal for the Polish Mission, promotion of Polish culture and history in USA, about which one cannot forget. Father chancellor Mirosław Król in September took part in a meeting of presidents of theological seminaries in Wrocław. He said an optimistic news to Polonia – the Seminary in Orchard Lake has been entered by three Poles from USA, there have been new students from Poland and three from Vietnam. Father Król expects that in next academic year more than 20 candidates to the priesthood will be studying in SS. Cyril & Methodius Seminary. Another point of the program was a speech by Dr. Kinga Kosmala from Northwestern University in Chicago. Mrs. Kosmala’s speech will be published in a next issue of “Polish Weekly”. Mrs. Henrietta Nowakowski, who is well-known to the community of Michigan, presented a project which she has tried to get going for two years. It pertains to tiding up 59 graves of Hallerczycy on Holy Sepulchre cemetery in Southfield, Michigan and commemorating this place with a monument. Director Górecki undertook realization of this plan, he has already taken some action searching for help within Polish government and other potential donators. At the moment, as he informed the attendees, he is looking for an artist that would undertake preparing a project of such monument. Also, Polish consul Piotr Janicki expressed a huge interest in this endeavor and promised his help in its realization. The plans of Mrs. Henrietta Nowakowski, Hallerczyk’s daughter, as well as her efforts made in favor of commemorating Polish patriots’ remembrance, require a wider analysis; we will dedicate to it an article in next “Polish Weekly”. There is only one more thing I would like to mention – the exhibitions accompanying the Meeting with Polonia. They are a possession of Mr. Jacek Kawczyński from the Society of Katyn Rally Memory and Identity. One of them, close to my heart, pertains to Fighting Solidarity, radical, anti-communist underground organization that set up in June of 1982 in Wrocław. Its leader and main ideologist was Kornel Morawiecki. The second exhibition – “The Polish Spirit of Independence” – arranged by Ministry of Culture and National Heritage, the Adam Mickiewicz Institute and “Fighting Solidarity” shows a way of regaining independence by Poland. Both of the exhibitions, interesting and educational, are exposed in Adam Maida library on Orchard Lake Schools campus. 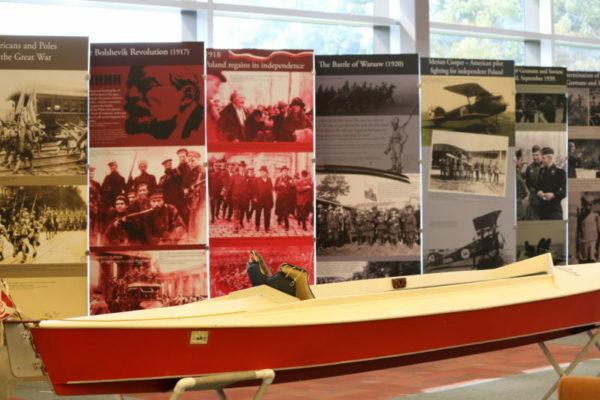 On the occasion of exploring the exhibition one can see also a kayak by which traveled cardinal Karol Wojtyła in 1976, during his visit to Orchard Lake and the Seminary. About the kayak’s history we wrote in 2010 when the Borowicz family gave it to Polish Mission to place it in museum. At that time the kayak was exposed in the Gallery and after it was closed due to an overhaul the exhibit was moved permanently to Cardinal Maida library. The red and white kayak was built by Edward Borowicz in the 1970’s, and was used by the Polish Boy Scouts. While visiting the Orchard Lake Schools and Seminary during September of 1976, the then Cardinal Karol Wojtyla, used the kayak on Orchard Lake. After thirty-four years, the kayak is being donated to the Polish Mission at Orchard Lake by Danuta Borowicz, Barbara Borowicz-Zaydel and the Borowicz family members as a memento of the Cardinal’s visit and excursion on the lake. We must remember that the Polish center in Detroit established 133 years ago and moved to Orchard Lake is the most important Polonia’s institution on American continent we are obliged to use our best efforts to keep it for next generations.